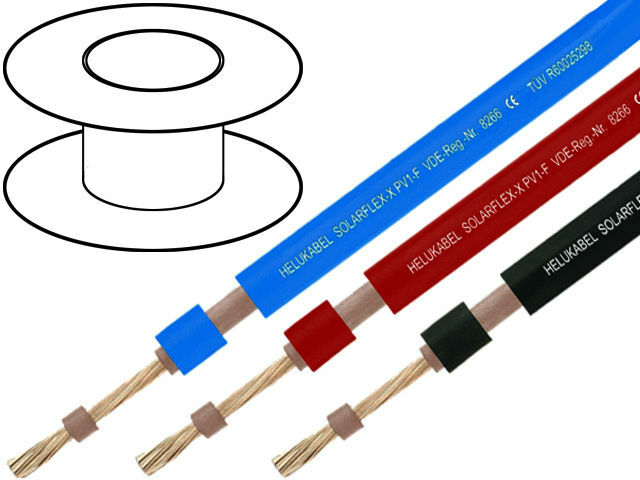 HELUKABEL® SOLARFLEX® is a family of single core wires dedicated for photovoltaic installations. Designed in the 90s, they were HELUKABEL®’s first wires for photovoltaic applications. Today, these TÜV- and VDE-certified wires are sold all over the world. Features like operating temperature from -40°C to +90°C, double insulation, resistance to ozone, weather conditions, UV, acids, and durable and abrasion resistant sheath, make the wires perfect for outdoor applications. When choosing these wires, you should remember that they are not designed for direct in-ground installation. However, their anticipated service time is 25 years. Currently, TME’s offer includes wires in black, blue, and red sheath, with core sections from 2.5mm2 to 10mm2. As a custom order, we can also offer other available core sections (up to 240mm2), as well as other SOLARFLEX® wires: rodent resistant SOLARFLEX®-X PV1-F NTS or twin core SOLARFLEX®-X PV1-F TWIN.